Affordable housing is in short supply in the Washington DC area. You’d think we could simply build more housing, but no aspect of development and land-use planning around here is easy. That’s particularly true where I live, in Montgomery County. Current zoning and land-use policies block simple steps such as construction of smaller, multi-unit buildings, townhouses, and other forms of “missing middle” housing. They severely restrict homeowners’ ability to add accessory dwelling units (ADUs) on their properties and they limit apartment-building construction along major transit corridors. These higher-density land uses — more units in a given land area = higher density — would lower the land cost per unit, lowering the price tag and boosting affordability. We should “densify” because people should be able to live close to work and amenities, and fewer and shorter trips mean fewer cars on the road, less fossil-fuel consumption and lower greenhouse gas emissions. Equity, environmentalism, traffic congestion, and affordability for all income levels dictate action. They dictate reforms that facilitate creating additional housing. Montgomery County has studied the matter, but a study isn’t a plan, and one like the county’s that prejudges acceptable steps won’t lead to needed change. Zoning is not sacrosanct. Minneapolis is likely to pass uniform upzoning in 2019, including reforms to allow up to three dwelling units on an individual lot in all residential neighborhoods and by allowing multifamily housing on select public transit routes, with higher densities along high-frequency routes and near transit stations. I see these reforms as a natural progression that we can and should consider. So how about if we systematically rezone to allow duplexes, triplexes, and quads within neighborhoods currently zoned for Residential Detached construction (a.k.a. single-family homes)? Montgomery County already has that on the edges of my neighborhood, in Takoma Park. Let’s take a look. The image below is a screen shot from Montgomery County’s MC Atlas information system. My home is to the right of the one where the red dot is located. Most of my neighborhood — the entirety of the area in yellow — is zoned R-60. You’re allowed a single-family home in a lot that’s 6,000 sq. ft. or larger. But you’ll note two small R-20 carve-outs — the R-20 areas, where lots may be as smalls 2,000 sq. ft., are brown — below the red dot. The carve-outs house a 13-unit condo apartment building and houses that are divided into apartments, which are both also allowed in R-20 zones. There’s a larger R-20 area to the right in the image, a long block of Takoma Park’s Carroll Avenue with many houses divided into apartments. Typical Montgomery County residential zoning that allows very limited housing diversity. This sort of development hasn’t harmed my neighborhood and it wouldn’t harm yours. There are several ways the County Council could allow it. 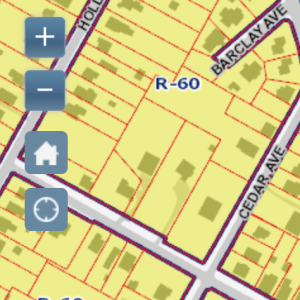 Two involve zoning map amendments, which change which zoning rules apply in particular areas. One approach is to change the zoning of selected Residential Detached areas to R-20 or R-30, which allow a mix of duplexes and small apartment buildings. Wider use of the R-20 and R-30 designations would also facilitate creation of smaller homes on less land via property subdivision, making these neighborhoods much more affordable. Nothing would force a current property owner to subdivide a property. Keep your large lot if you want. An alternative is to apply an overlay zone with rules that supersede those of base zone designations such as R-200, R-90, R-60, and R-40. We already have a number of overlays, covering specific areas and also “floating” zones that are applied to multiple, non-contiguous areas. For example, commercial areas in my part of the county are part of the Takoma Park/East Silver Spring Commercial Revitalization (TPESS) overlay zone. Others include Chevy Chase Neighborhood Retail (CCNR) and Germantown Transit Mixed Use (GTMU). I’d welcome county creation of a Takoma Park Commercial/Residential overlay that would allow the city to take progressive steps that might not fly at this time in other parts of the county. How about creation of a Missing Middle Floating (MMF) zone, applicable anywhere, that would allow townhouses, multi-unit houses, and small apartment buildings? We could also create new residential-neighborhood housing by changing the rules in established Residential Detached zones including Residential Estate areas. A modest and easy step would be to get rid of unnecessary restrictions on accessory dwelling units (ADUs). “An ADU is a smaller, independent residential dwelling unit located on the same lot as a stand-alone (i.e., detached) single-family home,” according to the American Planning Association. “ADUs go by many different names throughout the U.S., including accessory apartments, secondary suites, and granny flats.” My lot is 7,500 sq. ft. and could easily fit a second, smaller home in the back yard. My backyard neighbor’s property — the red-dot lot in the image above — is 19,058 sq. ft. and could actually be legally subdivided into three properties within our R-60 zone! But even smaller lots have room for an additional, smaller structure. Finally, we could add density within existing zoning by streamlining subdivision of larger parcels. Current rules are onerous! Subdivision allows construction within existing zoning rules. By way of illustration, I’ll zoom in on the MC Atlas image I used above, focusing on a couple of properties a few blocks from my home. Look just to the right of the house symbol: two properties carved out of a larger, rectangular property. I’m told that subdivision happened in the late ’80s or early ’90s. Each property of the two is over 6,000 sq. ft. and therefore conforms with the R-60 zoning, and note that the area’s historic-district designation was not an impediment. Numerous county properties are large enough to be subdivided, within existing zoning designations. I’ve sketched out several ways we could densify. We could allow multi-unit housing and expanded apartment-building construction via (reworked) overlay zones and via selective upzoning. We could liberalize existing zones to allow ADUs and to diversify the housing types allowed. We could take these steps without major disruption. Anticipating an objection: True, Montgomery County enacted a completely rewritten zoning ordinance just a few years ago, in 2014. But zoning code — and the guidelines captured in Master Plans and Sector Plans — aren’t sacrosanct. 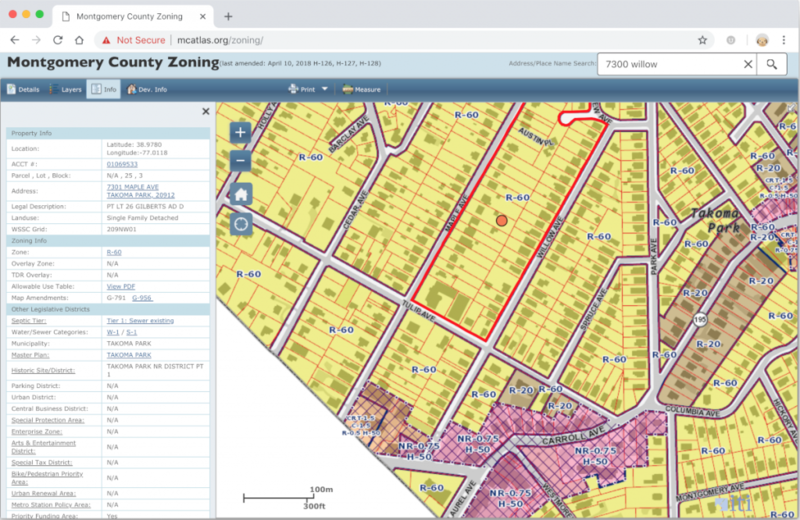 The County Council has considered 80 zoning text amendments (ZTAs) in the five years since the current code’s adoption, adopting 61 of them. We could start with smaller areas or we could go wide. For example, it’s likely the City of Takoma Park will seek a local map amendment soon, covering the R-60 property that Washington Adventist Hospital will vacate later this year when it relocates to White Oak. Densification should be a goal. Overlay zones provide an excellent way to go wide, to densify communities and types of area that are ready for it, and I see no good reason not to make incremental county-wide changes, for instance to allow free-standing ADUs in all Residential Detached zones. The one rule that’s sacred is that Montgomery County shouldn’t let convention stifle innovation, given our pressing need to create new affordable housing. Reporting vote percentages in multi-representative races can be tricky. If you compute a candidate’s vote percentage relative to the number of votes cast, you get a really misleading figure. A small point: but there’s a better way. It’s important to understand vote percentages as we evaluate Ranked Choice Voting, a system that allows voters to rank as multiple candidates in order of preference. RCV, currently before Montgomery County’s Maryland state legislative delegation as bill MC 29-19, ensures that an elected candidate was chosen by a majority of voters and not just a plurality. Let’s look at the 2018 Maryland Democratic primary. Thirty-three candidates ran for four at-large Montgomery County Council seats. (I was one of them.) Each voter could choose up to four candidates. At the December 17 delegation hearing on MC 29-19, an individual offered the primary winners’ vote percentages in his supporting testimony. The numbers he offered are deceptive because each voter could vote for up to four candidates, and in fact 437,616 votes were cast, by 130,957 Democratic voters, an average of 3.34 votes per ballot. So while the top vote-getter, Hans Riemer, won 12.21% of the vote – seemingly far, far from a majority – he also won 41% of the voters, that is, not so far off. The picture with conventional voting isn’t quite so skewed as this testimony suggested! It’s tempting to decry that the #4 vote-getter / #4 nominee, Gabe Albornoz, won only 7.38% of the vote, but that would be highly misleading. Gabe won 25% of the voters, that is, he was chosen on 25% of the ballots. And the gap between Gabe and the #5 vote-getter, Marilyn Balcombe, who won 6.26% of the vote, was not a mere 1.12 percentage points. Based on the number of ballots, it was a 3x wider 3.76 percentage points. Marilyn was chosen on 20.9% of the ballots cast. Not bad! It’s hard to say how RCV would have affected the 2018 at-large primary outcome. With RCV, as lower vote-getters are eliminated, lower-ranked choices on ballots that listed them are counted. Maybe the additional votes would have boosted Marilyn or another candidate into the top four. It’s hard to say. Much more likely RCV would have changed the outcome in the other 2018 Democratic primary contests, in Montgomery County races and many state legislative races, for instance in District 16, where only 12 votes separated the #3 (winning) and #4 (runner-up) candidates for the district’s three seats in the Maryland House of Delegates. 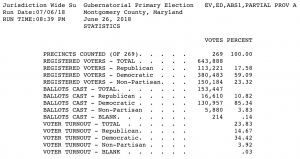 MC 29-19 only covers Montgomery County races, however, and not Maryland state races. I support it and hope it will pass – if you agree, please tell your state legislators – and that the State of Maryland will embrace Ranked Choice Voting in time for the 2022 primaries. RCV democratizes elections by empowering minority candidates, including in multi-representative races. RCV establishes a new way to count votes, so numbers are critical in any objective evaluation. Just remember to measure percentages relative to the number of ballots cast. A small point, but significant in understanding multi-rep race outcomes. County executive: Marc Elrich. Marc is the progressive candidate in the race, independent of corporate and moneyed-interest influence and highly capable, and the only candidate truly capable of listening, learning, and growing in office. Board of Education, at large: Karla Silvestre. Karla has extensive education and community engagement, deep Montgomery County roots, and the skills and knowledge to work with parents, MCPS staff and leadership, and BOE colleagues to make progress on the pressing needs facing our school communities. Board of Education, District 3: Lynn Amano. 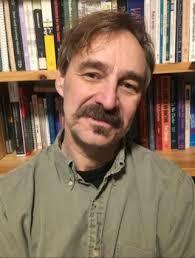 Lynn will bring a much-needed fresh perspective to the school board, one less accommodating of the school bureaucracy. Yes: Question 1– Requiring Commercial Gaming Revenues That Are For Public Education To Supplement Spending For Education In Public Schools. This is the “lockbox” we were promised when Maryland first legalized casino gambling. Unfortunately, revenues displaced and did not supplement, as intended, funding from other sources. Yes: Question 2– Same-Day Registration And Voting At The Precinct Polling Place On Election Day. This reform would extend same-day registration and voting from early voting to Election Day, expanding the electorate to late-activated potential voters. Yes: Question A– Redistricting Procedure – Composition Of Redistricting Commission. I would remove the explicitly-partisan party committees from the redistricting process. Yes: Question B– Changes the requirement needed to raise County property taxes above the inflation rate from 9 votes to a unanimous vote of the Council. This is a technical adjustment to existing law, to allow for a situation when a council seat is vacant. Yes: Question C– Would allow Councilmembers to hire aides outside the Merit System. 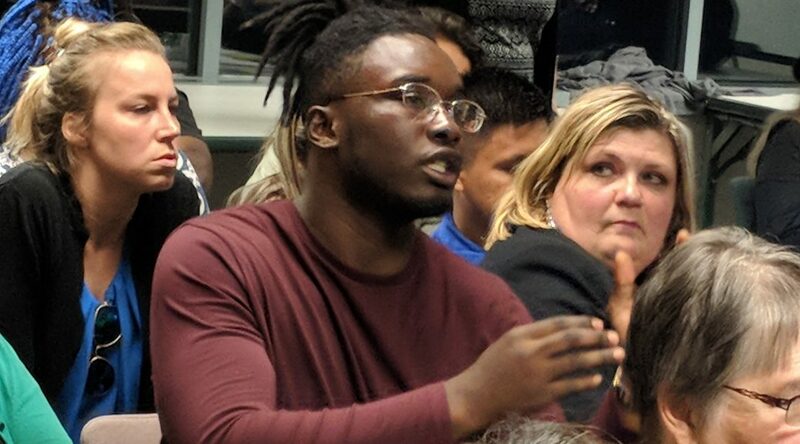 A councilmember should be free to hire non-status aides, whom the councilmember knows and whose politics matches the councilmember’s, without going through the charade of competitive hiring. Congress, District 6: David Trone. We need a Democratic congressional majority. Governor/Lt. Governor: Ben Jealous and Susan Turnbull. Jealous and Turnbull are strong progressives who would advance education, equity, justice reform, and environmentalism in Maryland. Attorney General: Brian Frosh. Frosh is an excellent AG who fights for Marylanders’ interests and deserves another term. … but in May declined to budget a modest $70,000 toward meeting our climate commitment. That won't do. Climate change is a global challenge, and we need to get serious locally, fast. Please vote for the environment when you vote in this month's primary. In December, the Council committed to "transform the climate by reducing greenhouse gas emissions by 80% by 2027 and reaching 100% elimination by 2035." It's an ambitious goal – and could generate very significant economic benefit – but we need to get moving. 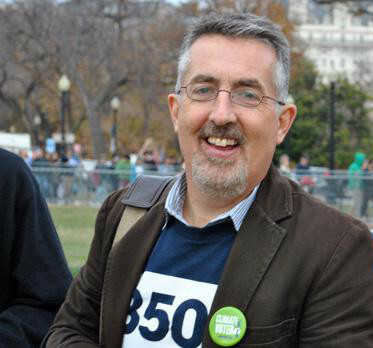 The nonfunded $70,000 would have paid for a Director of Climate Emergency Mobilization as a first step toward establishment of a Climate Emergency Office and steps beyond. Local advocacy matters, especially with the EPA in Scott Pruitt's thieving hands and Governor Hogan running state government. As my friend and neighbor Betsy Taylor, chair of 350 Action, puts it, "Montgomery County has a rich history of environmental activism, from those protecting our farmland and tree canopy to others promoting clean energy. Citizen engagement on these issues has been and always will be essential." It's citizen engagement that protected the Ten Mile Creek watershed and won Montgomery County's lawncare pesticide ban and polystyrene food serviceware ban, and that will lead to our closing the Dickerson incinerator and the County's coal-fired generating station. Which candidates do you trust to accelerate pro-environment policy-making and County investment? To enact clean-energy and zero-waste policies that respond to the climate emergency and live up to our commitment? Burning trash is dirty. Adoption of zero-waste policies is a necessary step toward closing the Dickerson incinerator, which send 200,000 tons of ash to landfill each year. We need to reduce waste via food recovery, high recycling rates, and elimination of single-use plastic food-service materials among other steps. No need for delay: organizations such as the Food Council have been pushing forward education and action campaigns. Locally, Takoma Park pioneered curbside food-waste collection for composting. We should move quickly to a county-scale program with phase-in of a requirement that all food serviceware disposables be compostable. Energy conservation and 100% clean energy are parts of the equation: solar and wind power, net-zero building standards and energy-efficiency retrofitting, a move to electric vehicles, and transit expansion. Smart roadways will add capacity to our existing road network and will speed trips and reduce emissions. And let’s reintroduce pension-fund divestment from fossil fuels and work with state legislators to pass new renewable energy portfolio standards. You can count on me to respond. I'll link you to my environment position and close by quoting climate champion Mike Tidwell: "Seth understands environmental challenges, and he knows how to make local government work. 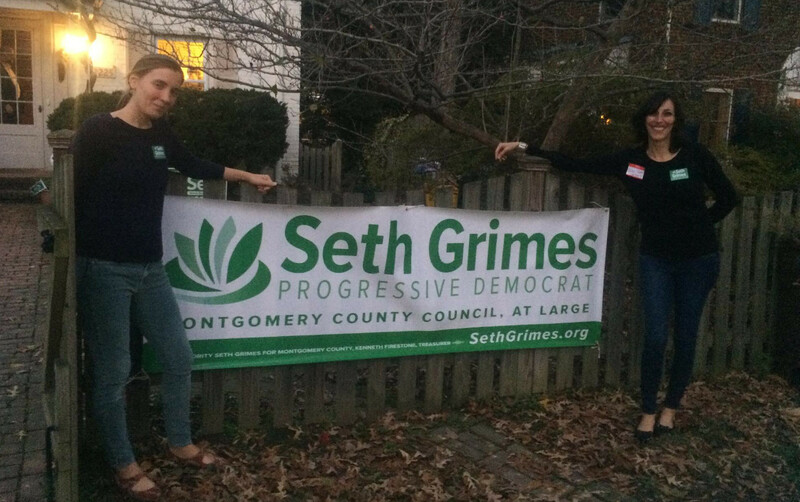 This is why I’m backing Seth for Montgomery County Council at large." Will you join Mike in supporting me? Please vote for the environment in this month's primary. Good news: The County Council included $246,500 funding for a drop-in center for youth experiencing homelessness in the County’s FY19 budget. Community advocacy made a difference, including at the May 9 program on Youth Homelessness in Montgomery County. Messages to the Council made a difference, including via the letter-writing campaign we set up. And this work certainly helped broaden awareness. The youth who spoke out at the May 9 program were amazing. We have posted a small set of photos from the event and LocalDVM posted an event video. Thanks also to the other program participants including Councilmember George Leventhal, who turned community advocacy into a specific funding proposal. The Department of Health and Human Services will be responsible for next steps, for opening the center and designing its programming. We hope and expect that HHS will take its lead from affected community members. There is work to be done beyond creating an initial drop-in center. Montgomery County has addressed veteran homelessness and is very near reaching the goal of ending chronic homelessness. The County’s Ten Year Plan to End Homelessness envisions comprehensively tackling youth homelessness next. The County will need active public and expert involvement. Let me know if you’d like me to keep you apprised of opportunities to help. Mental health matters. How can county government help? Mental-health issues impose a huge burden on Montgomery County families and individuals. Maybe you or someone you know has experienced their effects. Here’s a telling statistic: one in five students suffers from a mental health disorder, according to Christina Conolly, Montgomery County Public Schools’ director of psychological services. Data show nearly 7 percent of children ages 3 to 17 had ADHD, 3.5 percent had behavioral or conduct problems, 3 percent had anxiety, and 2.1 percent had depression. 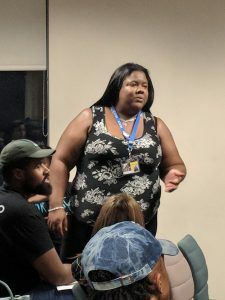 Mental health “affects everything you do, in terms of how you’re learning, how you’re sleeping, how you’re eating,” Conolly said, speaking at a February program. Montgomery County has some very good services that work with persons in need of mental health assistance, and excellent partners such as NAMI Montgomery County, EveryMind, Cornerstone Montgomery, the Collaboration Council, and Adventist Healthcare. We have youth and non-English-language partners such as Identity, and programs extend into Montgomery County Public Schools. We have a 24 Hour Crisis Center with mobile crisis outreach response. Yet there is unmet demand. We have insufficient psychiatric outpatient services and hospital beds for those with serious mental illness. This gap has overburdened our hospital emergency rooms and resulted in long ER waits for all county residents. Student mental and behavioral health are particular concerns, as is our reaction to individuals with mental health issues. The National Alliance on Mental Illness estimates that 70 percent of youth in the juvenile justice system have a mental health condition, and substance abuse and addictions are rampant. We must work with state regulators and with County agencies and providers to redouble our commitment and expand the scope of County mental health services and partnerships. I will support programs to reduce criminalization, suicide, and homelessness and promote measures to enhance recovery for all individuals with mental illness and behavioral health needs. I welcome your comments, stories, and suggestions. What has your personal / family experience been with mental and behavioral health issues and the support you’ve received? How can Montgomery County better support you and your family? If you have dealt with these issues, I admire your courage and would like to hear from you how we can improve life for residents confronting these challenges. Earth Day 2018 was yesterday, April 22, but the fight against climate change can’t be a once-a-year thing. Did you know that President Nixon created the Environmental Protection Agency in 1970, the same year as the first Earth Day? Yet with Donald Trump and Scott Pruitt undoing environmental protections, we’re back in an era of dirty politics, literally. Activism and state and local action are needed, now more than ever. Task #1 is to defeat Governor Hogan in November. It’s outrageous, for instance, that Hogan last year rescinded Maryland’s “zero-waste” goal and mandatory-recycling targets. Until November, and after, Montgomery County can and should lead the way. Last December, the County Council declared a Climate Emergency with a goal of reducing greenhouse gas emissions by 80% by 2027 and 100% by 2035. That’s good! The Council is taking a next step, creating a new Climate Policy Director post. (As a Takoma Park Councilmember, I supported hiring an Environmental Sustainability Manager in 2014, and I know the impact that dedicated staff can have on environmental education, planning, and programming.) Zoning Text Amendment 18-01, introduced by Councilmember Tom Hucker, will allow solar generation of up to 2 megawatts of electricity at a site, enough for 200 typical residential homes, equal to removing 310 passenger cars from the road. Excellent… noting however a need for ZTA modifications to respond to Ag Reserve concerns. We must move to 100% green energy — solar and also wind and geothermal — via net-zero commercial and residential building standards, retrofitting, and rapid transition to electric vehicles, with the charging facilities to support them. Let’s stop burning our trash. Via waste reduction and waste recovery, we can shut down the Dickerson incinerator without simply sending our trash to landfill. The County should push for much-higher recycling participation and move toward broad organics (food-waste) composting and away from single-use plastics, and we should explore technologies for atmospheric-carbon drawdown. Let’s preserve and restore our watersheds, expand our parks, plant trees, make wise transit and development decisions, and improve walkability and cycling infrastructure. We know how to do these things. For instance, the City of Takoma Park has provided curbside food-waste collection to all single-family homes since 2014. Takoma Park bans disposable single-use plastic bags and has considered a requirement (like San Francisco’s) that food-service establishments use only compostable disposables and collect all disposables and food waste for composting. Actually, the County has been taking sensible environmental steps for a decade — I count a variety of January 2009 Montgomery County Climate Protection Plan recommendations that have been realized — but the challenge remains daunting. 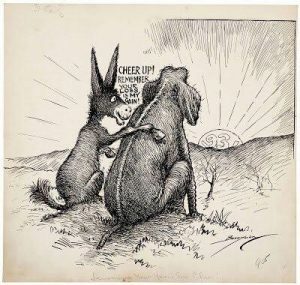 For each success like the creation of a Green Bank to finance energy efficiency projects, there are a dozen unrealized ideas on the table, and we have faced defeats such as a court ruling overturning the County’s Healthy Lawns Act, which banned nonessential pesticide use. Today is Earth Day + 1. I’m dedicated to making every day Earth Day, via local action to combat climate change and protect the environment. Are you on board?